Davey and Co have are the purveyors and manufacturers of bronze, brass, gunmetal and wooden fitting for classic boats and yachts. Relying on traditional small foundries to cast small runs of cleats, stanchions or fitting that are over 100 years old. Davey wooden blocks are made using traditional methods and sized for the small dinghy to a large yacht. For owners of a classic wooden or steel boat, Davey has a range of portlights, pumps, locks, catches, and hasps as well as traditional classic boat lighting. 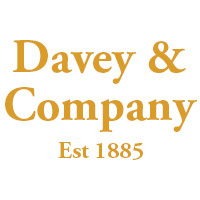 Established in 1885 we are proud to supply Davey and Co chandlery and classic boat products worldwide. The ash pins are 337mm in length and are used as a traditional method to cleat rope. Made from Ash Wood these Beads will help your main sail hoist easier whilst still keeping a traditional look on the jaws of your gaff or gunter rigged yacht. The sailmakers pack comes complete with an extended thumb guard. The device is easy to use and compact so that it fits perfectly in your tool box. Davey and Co. Belaying Pin Brass 61/4" x 3/8"
The brass pins are 158mm in length and are used for a traditional method to cleat rope. Davey and Co. Coat Hook Brass 2"
These traditional coat hooks will be a convenient addition to your boat. Red lead powder is used for caulking & underwater seams. Mix around 16:1 with linseed oil putty. This bright orange powder is toxic and therefore handling precautions, including gloves and mask, should be observed at all times. The hand sewing machine is a quick and easy method of sewing most fabrics. It is supplied with a bobbin of waxed thread, one bent needle and an instruction sheet. Manganese bronze dee shackle. Pin diameter and shackle diameter are the same. Breaking strain: 3mm - 400kg, 4mm - 500kg, 5mm - 600kg, 6mm - 1000kg, 8mm - 1600kg, 10mm - 2400kg. Manganese bronze harp shackle. Pin diameter and shackle diameter are the same. Breaking strain: 5mm - 400kg, 6mm - 800kg, 8mm - 1200kg, 10mm - 1600kg.